Here, six incredible Shanghai bars including Tiki China, which offers tropical drinks and Polynesian-inspired snacks. Shanghai's new speakeasies specialize in showmanship—secret passageways, retro themes—and stellar drinks with Asian flavors. 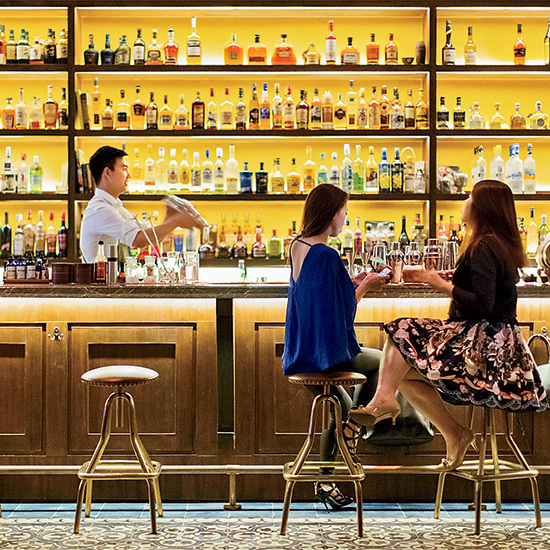 A forerunner of Shanghai’s craft-cocktail movement, Senator Saloon offers classic cocktails like the sidecar, matched with snacks like pork belly sliders with pickled cabbage. The red-velvet-lined space feels like it came straight out of 1920s Chicago. 98 Wuyuan Rd. ; 5423-1330. A monsoon wind has brought tiki culture to Shanghai; shrunken-head mugs and scorpion bowls are everywhere. The tiki-est of all is Tiki China, which serves tropical drinks and Polynesian-inspired snacks, like slow-roasted pork knuckle. Bldg. 22, Hengshan Fang, 320 Tianping Rd. ; 6415-0363. No passwords are required to enter this Prohibition Era–style collaboration between two Chinese American expats. Yao Lu barrel-ages cocktails, while Austin Hu oversees the menu of comfort foods like s’mores cupcakes and meatballs glazed with Ikea’s lingonberry jelly. 64 Fenyang Rd. ; 6418-3077. Starling specializes in rum drinks, like a Pineapple Old Fashioned. This bar’s palm-shaped ceiling fans and rum-centric drinks menu evoke the colonial era. The best cocktail is the spicy Tom Yum Colada, made with coconut milk, pineapple and lime juice. 99 Taixing Rd. ; 6217-0189. Inspired by bars like New York City’s The Dead Rabbit, two of Shanghai’s star mixologists created this lounge in a 1930s townhouse. The duo usually work behind the bar on the second floor, where they will tailor a cocktail to your tastes; if you request a rum drink, you might see them burn star anise to fill a glass with aromatic smoke. 17 Gaoyou Rd. ; 5411-1189. Owned by a Spanish chef, this attic bar serves tapas and Asian-inflected cocktails. The Appeasement of Ching Dai is an homage to the film Big Trouble in Little China, with baijiu (a vodka-like Chinese spirit) and tart hawthorn-berry syrup. Zhong Plaza, 99 Taixing Rd. ; 6256-3587.